Nor-Cal Bus Fest on August 17, 2008. There were also several "other" air-cooled models in attendance at the Solano Fairgrounds. While the number of Type II's was down from previous events, the enthusiasm level of the hundreds of enthusiasts was definitely up. Jahnai from Richmond and Greg from Santa Rosa each brought out several of their own vehicles, and there was a "new to Bus Fest" 1953 Deluxe owned by Drew, among the handful of Barndoor models in attendance. Once again, Todd and the Sacramento crew arrived via a good-sized Caravan. Danny Z even drove all the way from San Bernardino in his right-hand-drive, European Mango Sunroof and won the long distance award. There were some freshly painted vehicles and some "new" ones as well. I'm glad to report that the Type II hobby is definitely alive and well in Northern California, despite high gasoline prices and a sluggish economy. I'm confident that if the northern California Barndoor owners get serious about it, the all-time record could be broken at the next Bus Fest. What do you think...Todd, Dean, Mark, Drew, Richard, Dave, Matt, Tony, Jayson, Rick, Jim, Justin, Jared, Mike? I'm not sure of the exact number, but that list has well over 25 Barndoors between them! Award winners are listed below. The end-of-the-day raffle is often an event highlight, and this was hands down the best Bus Fest raffle yet. There were dozens of great t-shirts, helpful tune-up kits and manuals, valuable gift certificates and parts in the raffle donated by very generous folks such as LaVeres VW Restoration, Wolfsburg West, Niello Volkswagen, Honest Engine, Gregs VW Service, Kombi Haus, Vintage Wheels and TK Clothing. This time there was also a N.O.S. Steering/Ignition Lock and the Grand Prize was a Wood-Slat Roof Rack! (from Tony the Hat.) But wait...there was one additional Grand Prize, a rear Hurst Bumper from Vintage Warehouse! Thank you to all of the sponsors and donors that made the raffle excellent, and to everyone who attended Bus Fest 3. The Bus Fest Crew of Marilee, Tony, Gen, Marilynn, John and Diana did a great job making things run smoothly...thank you for making it happen. 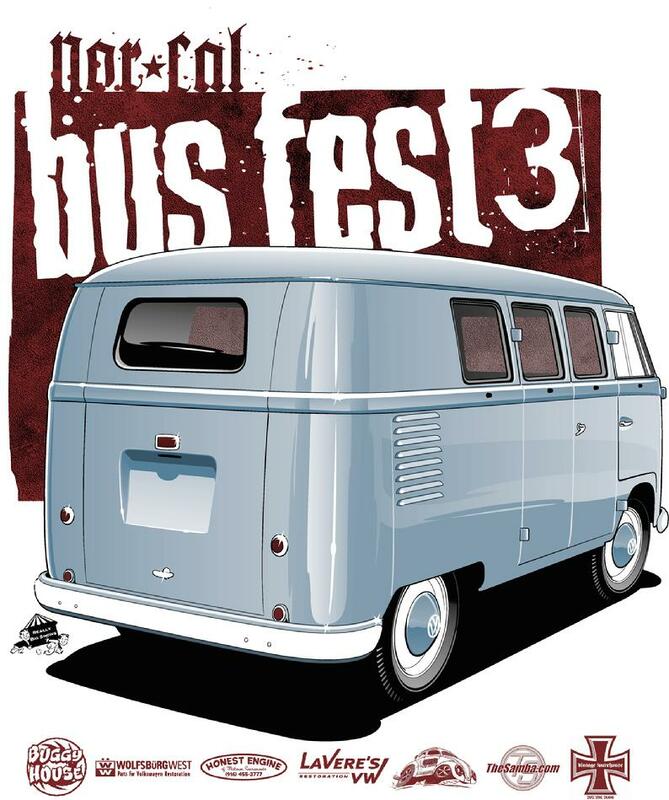 Plans are underway for Nor-Cal Bus Fest 4 in Spring of 2009, please check back often for updates. Danny drove his RHD Mango Sunroof all the way from San Bernardino, winning the Long Distance Award. Dave's clean Concord-based 15 Window and a lowered 23 Window. Barndoor Deluxe lineup, There are quite a few very nice Barndoor Deluxes in the area. Thanks to Drew, Mark and Matt for bring out these beauties! Tom's Camper, Thom's VintageBus.com Double Door and Jeremy's Custom Class Award winning Deluxe caravanned down from Sacramento. Jim's 54 Microbus has to be the world's fastest Barndoor! Sweet 15 Window with faded original paint. NAG (Nor -Cal Aircooled Group) made quite a showing. Any BF3 video Taylor? Greg from Vintage Warehouse won the Truck Class with his '62 Vendo. He also donated a Hurst Rear Bumper for the raffle...thank You Greg! Super-clean custom Deluxes were everywhere. Single Cabs were well-represented at Bus Fest 3. Jahnai from Richmond brought out three of his vehicles for the event, including this clean white '63 Pickup. Thanks Jahnai!